The Mark 14 torpedo was the standard weapon on the more modern U.S. submarines by 1941. It had a sophisticated magnetic detonator, the Mark 6, that was supposed to set the weapon off directly under the keel of a ship, where it would break the ship's back. Design work began in 1931 for a replacement for the Mark 10 with greater range and a larger warhead, and continued for seven years. However, frugal budgets and an obsession with secrecy meant that it was live-tested exactly twice before being issued to the fleet in 1938. One of the tests failed, which ought to have raised a red flag, but the Navy was reluctant to fund further live-firing tests. It was not until war broke out that the flaws of the torpedo became apparent, with one submarine commander (Jacobs of Sargo) correctly reporting within the first month of hostilities that there were problems with depth keeping and with the magnetic exploder. It took the Navy an astonishing two years from the start of hostilities in the Pacific to officially recognize that the weapon ran ten feet too deep, that the magnetic detonator was unreliable anywhere but the North Atlantic (and probably there as well), and that the contact detonator usually failed on normal impacts. In one notorious incident, the commander of submarine Tinosa crippled a large Japanese whaler, Tonan Maru #3, with two spreads of six torpedoes, then carefully squared off his boat and fired no less that nine additional torpedoes at a theoretically perfect angle of impact at the theoretically perfect range. Not one detonated. The problems with the Mark 14 were largely resolved by 1944, and U.S. submarines began to take a crippling toll of Japanese warships and merchantmen; but the Mark 14 never became a wonderful torpedo, though its overall hit percentage by the end of the war was 36%. One reason why the Mark 6 magnetic detonator was retained for so long was that the Mark 14 had a relatively small warhead, little over half the weight of the Long Lance warhead. This was inadequate against the armor belts of capital ships, and could not even guarantee the sinking of a large merchantman. It was felt that the torpedo had to explode under the keel of the target to ensure destruction. 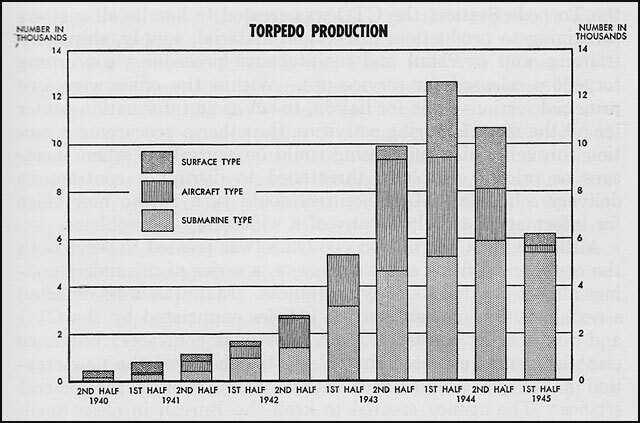 The firing of large spreads of torpedoes was ruled out by the slow rate of torpedo production. Occasional successes with the magnetic exploder, such as those reported by "Mush" Morton on his highly successful patrol with Wahoo in January 1943, created pressure to try to improve the reliability of the exploder rather than abandon it. The reliance on the magnetic detonator also helped conceal the problems with the depth setting. Since the torpedo was intended to run under the target anyway, a torpedo run that was too deep was not immediately obvious. During development of the Mark 14, a practice warhead was used that contained a liquid approximating the weight of explosives. 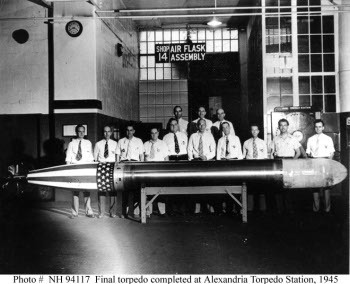 This was ejected by air from the air flask at the end of the run, to ensure that the torpedo would have enough overall buoyancy to be recovered after test firing. However, the exercise torpedoes weighed less than the combat model, and this threw off the trim of the torpedo enough to ensure that torpedoes with the combat warhead would run too deep. The problem was apparently also aggravated by poor placement of the hydrostatic sensor used to determine depth, which gave erroneous readings, particularly at the higher speed setting. Once the problem was confirmed by tests using target nets conducted under Lockwood in Australia, submarine commanders were instructed to adjust their depth settings accordingly. Later, a modification kit was distributed for the Mark 13 Mod 3, and torpedoes so modified were identified as Mark 13 Mod 3A. So serious were the problems with the Mark 14 that consideration was given to adopting the highly reliable British Mark VIII torpedo. However, this would have mean extensive delays modifying torpedo tubes to take the new torpedo and retooling assembly lines for its manufacture, and the plan was never adopted. Not only did the Americans suffer from the poor quality of the Mark 14 early in the war; their torpedo production facilities were inadequate to wartime demand. Some 300 torpedoes were lost when the Japanese bombed Cavite, which was a substantial fraction of the Navy's entire reserve. American submarines occasionally went to sea armed with mines instead of torpedoes, and were instructed to fire only one or two torpedoes against merchant targets. Fortunately for the Americans, production ramped up later in the war, ending the shortage. 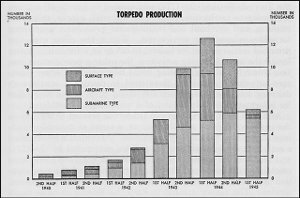 Production of submarine torpedoes peaked in late 1944 at about 1000 torpedoes per month. The 31 knot speed setting was rarely used during the war, and the Navy eventually produced a simplified single-speed version, the Mark 23, that ran only at 46 knots and was otherwise essentially identical to the Mark 14. This version had a hit percentage of 40%, probably because it was introduced later in the war, when most of the bugs in the Mark 14 family had been worked out.